The Oklahoma Golf Hall of Fame announced it will again award two $5,000 scholarships in 2018, one to a male and one to a female. 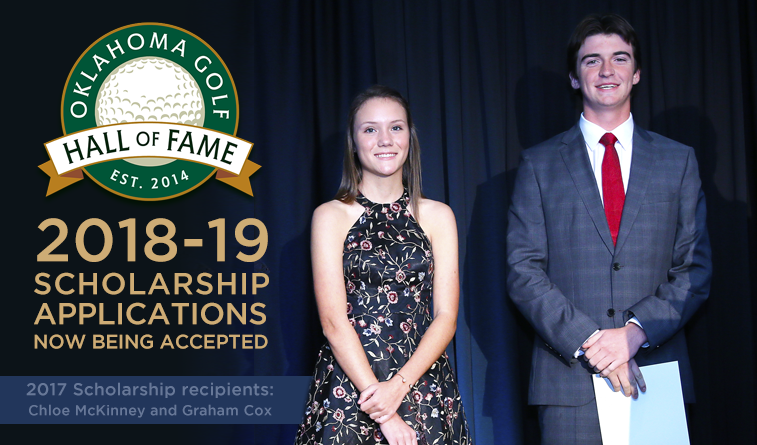 The Oklahoma Golf Hall of Fame Scholarships are for high school seniors graduating in 2018 and going to attend an Oklahoma four-year college or university. Also eligible are students already enrolled in an Oklahoma four-year college or university who have an interest in golf. The specifics of the criteria and the application form for the Hall of Fame scholarships are both available at www.oklahomagolfhof.org. The recipients must have an interest in and relationship with the sport of golf, though not necessarily as a member of a competitive team. Deadline for entry is April 15, 2018. Entries must be mailed to Oklahoma Golf Hall of Fame, 6218 S. Lewis Ave., Suite 200, Tulsa, OK, 74136, or emailed to ken@golfoklahoma.org. Winners will be announced no later than June 1, 2018 and will also be honored at the Hall of Fame Classic fundraising golf tournament tentatively scheduled July 16 at Oak Tree National. The next class for the Hall of Fame will be inducted in 2019. The initial recipients of the Hall of Fame scholarships in 2016 were Hadley Walters and David Trimble, followed by Chloe McKinney and Graham Cox in 2017. The latter two were honored at the 2017 dinner inducting Bob Tway, Doug Tewell, Mark Hayes, Joe Walser Jr. and Ernie Vossler.